The Mini Moke is a vehicle based on the Mini designed for the British Motor Corporation (BMC) by Sir Alec Issigonis and John Sheppard. The name comes from "Mini", the car with which the Moke shares many parts, and "Moke", an archaic dialect term for "donkey". The Moke has been marketed under various names including Austin Mini Moke, Morris Mini Moke and Leyland Moke. The initial design was a prototype for a light military vehicle in the style of the American Jeep, but its small wheels and low ground clearance made it impractical as an off-road vehicle. It was subsequently offered in a civilian version as a low-cost, easily maintained utility vehicle. The Moke achieved success as a beach buggy, becoming a popular "cult" vehicle in the Algarve, Seychelles, Australia, the United States and tropical resorts in the Caribbean. The original Moke used identical engine, transmission and suspension parts from the Mini Van. The first Mokes were only built at BMC's Longbridge, Birmingham plant. 14,518 Mokes were produced in the UK between 1964 and 1968, 26,000 in Australia between 1966 and 1981, and 10,000 in Portugal between 1980 and 1993 when production of the Moke ended. When Issigonis designed the Mini, he planned another vehicle to share the Mini's mechanical parts, but with a more rugged body shell. This was an attempt to take a portion of the military vehicle business from Land Rover. Issigonis had previously designed the Nuffield Guppy in a failed attempt to break into that market. By 1959, BMC had working prototypes of what was codenamed "The Buckboard", later to become the Mini Moke. These prototypes were shown to the British Army as a parachute-droppable vehicle, but poor ground clearance and a low-powered engine did not meet the most basic requirements for an off-road vehicle. Only the Royal Navy showed any interest in the Buckboard, as a vehicle for use on the decks of aircraft carriers. Early promotional material made much of the lightness of the vehicle, showing four soldiers travelling in the Moke off-road, then picking it up by its tubular bumpers and carrying it when (inevitably) its low ground-clearance proved inadequate. In a further attempt to make something for the army, a few four-wheel drive Mokes were made by the addition of a second engine and transmission at the back of the vehicle with linked clutches and gear shifters. This did nothing for the ground-clearance problems, and mechanical complications discouraged development beyond the prototype stage. This vehicle was called "The Twini" and was shown to the US Army—again with no success. Three of these vehicles were used by the Brazilian Army after being captured during the 1969 Rupununi Rebellion from Guyanese rebels, who had crossed the border into Brazil. During the Rhodesian Bush War there was an attempt by the Rhodesian Security Forces to create an Armoured Moke as an improvised fighting vehicle, which was seemingly unsuccessful. In parallel to its military past, the Mini Moke met with great success in the 1980s with a world-renowned actress and model: Brigitte Bardot. Eventually BMC gave up on the idea of selling the Moke to the military, and in 1963 the decision was made to build a civilian version, targeting farmers and light commercial applications. Several prototypes were built in 1963, one of which is still known to exist in Pinner just outside London, England. The Moke was launched onto the British market in 1964. The British Customs and Excise department decided that the Moke should be classified as a passenger car rather than as a commercial vehicle, which meant that it attracted purchase tax, reducing sales in its intended commercial market. 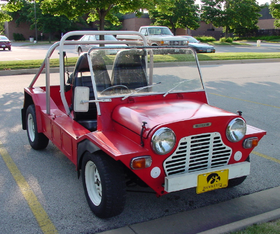 The Moke attracted attention as a "cult" vehicle as a result of the unprecedented success of the Mini and through media exposure in the popular television series The Prisoner, as well as in the Traffic song "Berkshire Poppies". Despite this, only about a tenth of the 14,500 British produced Mokes were sold in the United Kingdom. Mokes continued to be made in Britain until 1968. British-made Mokes were fitted with a low-end 848 cc transverse inline-four engine, detuned to use low-octane fuel. They used the same suspension, gearbox and 10 inch wheels as the standard Mini. In the initial offering, passenger seats, grab handles, heater, windscreen washer and a removable canvas top were all optional equipment delivered separately from the vehicle. Owners had to bolt these optional extras onto the vehicle themselves. The base price was GB£ 405. The "Mk I" Mokes had a single windscreen wiper and a floor-mounted headlight dip switch, and the only colour available was "Spruce Green". In 1967, the "Mk II" Moke added a passenger-side wiper. Horn and headlight controls were moved onto the indicator stalk. These later British Mokes were also available in white. The John Player & Sons cigarette company ran a team of Mokes in autocross competitions on grass tracks through 1968. These vehicles were equipped with rollover protection and used the Mini Cooper S 1275 cc engine. Despite the lack of success in selling the Mini Moke to the British Armed Forces, an unknown number (unlikely to have been more than a handful) of examples were apparently used by Land Forces Falkland Islands during the Falklands War and its immediate aftermath; the source of these vehicles is unclear. At least one commandeered civilian Mini Moke was also used by the Argentinian Forces during their occupation of the islands. The Moke was built in Australia from 1966 to 1981 where it was originally marketed as the Morris Mini Moke and from 1973 as the Leyland Moke. Initially Australian Mokes had the same 10-inch wheels as British Mokes and Mini saloons but in 1968 these were replaced by 13-inch wheels with longer rear trailing arms, which made them more practical for gentle off-road or beach use than the British version. There was also a widening piece welded to the wheel arches, front and rear to allow for wider tyres and rims. The solid metal seats of the British Mokes were replaced with tubular-framed "deck-chair" seats. This variant started with a 998 cc engine, which was switched mid-production to 1,098 cc. In 1976, with the advent of new anti-pollution requirements (Australian Design Rule 27A), the locally manufactured 1,098 cc motor was replaced by an imported version of the 998 cc motor with an air pump and exhaust gas recirculation, which had been developed to meet UK (US?) anti-pollution requirements. For a brief period around 1971, Leyland Australia produced a variant referred to in Leyland literature as "Moke, special export", but commonly called a "Californian", which had a 1,275 cc engine and was fitted with side marker lamps and different rear lights to conform to US FMVSS standards. The fuel tank from the Austin Sprite or MG Midget was fitted beneath the rear load area, replacing the standard tank mounted in the left sidebox. The export Californian was readily recognisable by its roof and seats, trimmed in "Op-pop verve" black and white tiger striped vinyl or "Orange Bali" vinyl, which looked rather like a fruit salad, and was briefly marketed to the "flower power" culture in the United States. The name "Californian" and the 1275 cc motor were resurrected in 1977 for Australian market Mokes with denim seat covers, more comfortable seats (which concealed the same basic frame within), spoked wheels and complex tubular bumpers (known as "roo bars"). Australian Mokes were exported to many countries, and pioneered large-scale exports of Australian-made vehicles. Leyland Australia made much of these exports in its advertising. The use of Australian-made Mokes by the Israeli Army (complete with a machine-gun tripod mounted in the rear) attracted controversy and media attention. From 1975, a pickup version of the Moke was produced, with a 1.45 x 1.50 metre (55 x 59 in) drop-sided bed which protruded behind the back of the vehicle, and a cloth top over the cab area. 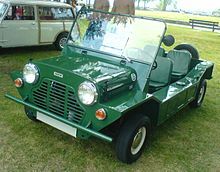 At least two four-wheel drive Moke prototypes were manufactured by Leyland Australia in the late 1970s, but unlike the British version, these used just one engine. Leyland were planning to market this version, but Moke production in Australia ended in 1981 and all that remains of the project is one of the prototypes which is now owned by an enthusiast in Western Australia and a modified differential crownwheel with gearteeth cut in the side to drive the rear tailshaft, in the personal collection of a Melbourne Mini specialist. In 1977 a 1275 cc Cooper S-engined Moke (sponsored by Coca-Cola) was entered into the Singapore Airlines London-Sydney Marathon. The car was driven over 30,000 km (19,000 miles) over 30 days and finished in 35th place. As Australian Moke production wound down, manufacturing was transferred to British Leyland's subsidiary in Portugal, which made 8,500 of the "Californian" Mokes in the Setúbal IMA plant between 1980 and 1984. In 1984 production was transferred to the Vendas Novas plant. Initially these Mokes were identical to late-model Australian Mokes; very soon, however, they were altered to use then-current British production Mini saloon components, including the standard-length Mini rear trailing arms and the 12–in wheels with modern low-profile tyres, which the saloon had acquired during the Moke's absence from Europe. In 1990, British Leyland (by then called Rover Group) sold the "Moke" name to Cagiva, a motorcycle manufacturer in Bologna, Italy. Production continued in Portugal until 1993, when Cagiva transferred the tooling to their factory in Italy with the intention of restarting production in 1995—which they never did. Since Cagiva did not own the "Mini" name, the 1500 cars they built were sold simply as "Mokes". This brought the total production run of Mokes and Moke derivatives to about 50,000. Mokes retain their cult status, and there are many enthusiastic restorers. The Moke's construction is simple. The body mainly consists of two box-section "pontoons" or "sideboxes" running between the front and rear wheels, and include (non-hollow) extensions of that from the back of the car all the way up to the front. These are connected by the floor pan, the firewall and a sturdy lateral torque box that runs under the front seats and stiffens the body in torsion. The left-hand pontoon contains the fuel tank; the right-hand has a compartment for the battery and a small lockable storage area. The 1972 "Moke, Special Export", commonly referred to as a "Californian" Moke, has an Austin Sprite/MG Midget type fuel tank fitted beneath the rear floor area to meet the American FMVSS safety requirements of the time. Standard Mokes of the same period and later Californian Mokes use the conventional tank mounted in the left sidebox. Later Portuguese Mokes have additional lockable storage space at the rear of the vehicle. The optional cloth canopy has plastic side windows, and is held up by a thin tubular structure that can easily be removed when not needed. In later versions this was replaced with a more solid roll cage. The windscreen can easily be unbolted and removed if not needed. There are just three curved panels in the Moke, the bonnet, the firewall and the floor, each of which is only curved in one direction. This makes it relatively straightforward to reproduce and replace Moke body components without access to sophisticated machine tools. Because the Moke's A-Series engine, manual gearbox and suspension are identical to those of a standard Mini (which was still in production up to October 2000), most spare parts are still readily available. The Moke has no chassis, so the wheels, brake assemblies and suspension are attached to front and rear subframes bolted straight onto the monocoque shell, just as with a standard Mini. Mokes tend to require much structural maintenance if they are to stay in good running order. The Mini Moke is a popular rental car in the Seychelles, Barbados, Mauritius and many other tropical countries. The Moke gained much popularity as a beach buggy and was often rented to tourists in tropical island resorts such as Mauritius and Barbados. The car also found a market in Macau, where it became the official transport for the local police; the Happy-Rent-a-Car company also owned 43 of the vehicles, which were made available for hire until February 2006 when they were outlawed by new car safety laws. The Macau branch of the car rental company Avis ran a fleet of Moke look-alike "CUBs" until July 2007. 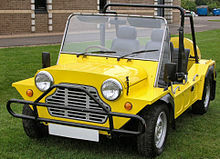 The CUB, although it resembled the Moke, was designed by Charles Andersen of Liverpool, England and used a 1275 cc version of the A-Series engine. On Magnetic Island, off Australia's Queensland coast, Moke Magnetic still operate a large fleet of Australian-made Mokes for hire to tourists. Mini Mokes can still be seen around the town of Victoria, Seychelles, as it is still a popular mode of transport for tourists and can seat four people in relative comfort. In the early 1970s, a Mini Moke was the first motor vehicle to be driven on Pitcairn Island and thereby became the most remote vehicle on Earth. It was chosen because it was the only off-road vehicle that could be lifted by the island's only crane—there being no dock or airstrip at Pitcairn. However, the rough terrain and heavy rainfall proved too much for the Moke and it soon broke down. Eventually, a second and later a third Moke were sent to the island, and by cannibalising the three for spares, the island's sole vehicle remained running until at least 1988. The Moke was identified as an ideal conversion for use in railway service. Two differing modifications were made; one using backing plates and spacers, the other a more conventional road-rail system. Tasmanian Government Railways ran a fleet, estimated at 16, of hard-topped Mokes for inspection and maintenance service on its narrow-gauge network. These Mokes had slightly modified suspension, and used spacers and backing plates so that the wheels sat on and tracked on 3 ft 6 in (1,067 mm) gauge track Similarly, the Federal Government, through either its Commonwealth Railways or Australian National Railways Commission, ran at least two similarly set up Mokes on its Central Australia Railway. At least one of these Mokes also operated on the isolated Eyre Peninsula network. George E Moss and Co (trading as GEMCO) developed a road-rail system based on a Western Australian Government Railways design which was fitted to at least two Mokes: one used by the District Engineer, Perth, and the other by the District Engineer, Northam. In October 2016, a "Panorama Mokes" event was held which brought together a group of Mini Mokes alongside their 'tin top' cousins the 'Classic Minis' which met at Bathurst, New South Wales, Australia. Alongside the Minis, the Mini Moke also celebrated milestone of 50 years since production in Australia and participated in a four-day event with everyone arriving on cue to the 2016 Supercheap Auto Bathurst 1000. While BMW-owned Mini has discussed other vehicles named after the Moke, no production has ever taken place. A concept car called the MINI Beachcomber, which draws heavily on Moke styling, was never produced. In 2008, the NOUN'ELECTRIC company commercialise for the first time an electric MOKE named NOSMOKE and homologated as a heavy quadricyle (European l7e category). The first car is made in China but the quality doesn't fit the market. The second (and current model) is produced in France in Cerizay where the Heuliez factory was before standing. In 2016, Moke America, LLC introduced an electric Moke vehicle (eMoke) in the United States. The eMoke is an all electric low speed vehicle (LSV) manufactured in America by Cruise Car Inc. In 2012 Moke International teamed up with designer Michael Young, Chery Automotive and Sicar Engineering to design a new version of the Moke, styled MOKE. It was released in Thailand, Australia, the Caribbean, the Seychelles and Mauritius, and Egypt by 2016. ^ Mini-Moke Driver's Handbook Supplement. ^ John Sheppard, car designer – obituary. The Telegraph, 11 May 2015. Retrieved 15 May 2015. ^ a b c Nuttall, Tim. Mini Moke 1964–1989. ISBN 1-870642-94-5. ^ a b c d e f g Rees, Chris. Complete Classic Mini 1959–2000. ISBN 1-899870-60-1. ^ a b Clarke, R. M. Mini-Cooper 1961–1970. ISBN 0-907073-17-4. ^ a b c d e f Clarke, R. M. Mini Moke Ultimate Portfolio. ISBN 1-85520-690-0. ^ a b c d e f Clarke, R. M.; Nuttall, Tim. Mini Moke, 1964–1994. ISBN 1-85520-240-9. ^ Bastos, Carlos Stephani. "Austin Mini-Moke: No Exército Brasileiro um desconhecido" [Austin Mini-Moke: An unknown in the Brazilian Army] (PDF) (in Portuguese). Universidade Federal de Juiz de Fora. Retrieved 20 August 2015. ^ Golding, Rob (1979). Mini. Osprey Publishing. ISBN 0-85045-314-3. ^ White, Matthew; Jaffer, Ali. The Official Prisoner Companion. ISBN 0-446-38744-4. ^ All Time Greats Group 5 Number 109. International Masters Publishers AB. 1968. ^ Chapman, Giles (7 September 2004). "Mini Moke: The obstinate pony". The London Independent. Archived from the original on 30 January 2008. Retrieved 2 February 2007. ^ a b c d The Mini Moke Club (1997). A Guide to Mini Mokes. Butterworth & Pilkington. ^ Sheather, Merv. "Morris Marina/Ital: E-Series powered in Australia". Retrieved 16 September 2007. ^ a b William Norman Staton-Bevan. The book of the B.M.C. Minis: Austin and Morris Minis, Wolseley Hornet, Riley Elf, Cooper and Cooper "S" Models and the Mini-Moke. ISBN 0-273-40695-7. ^ "No Moke". Macau Business. 1 March 2006. Archived from the original on 27 September 2007. Retrieved 2 February 2007. ^ "Andersen Cub". Mini Marcos Owners Club. Archived from the original on 28 September 2007. Retrieved 2 February 2007. ^ "Moke Magnetic". Moke Magnetic. Archived from the original on 13 February 2007. Retrieved 2 February 2007. ^ "Mokewerx – Tasmanian Railway Mokes". Retrieved 1 August 2010. ^ "Facebook events: Moke Panorama". Facebook.com. Retrieved 24 June 2018. ^ Clark, Andrew (12 January 2010). "BMW surfs on Mini's sporty image with new Beachcomber model at Detroit motor show". The Guardian. Retrieved 20 April 2010. Wikimedia Commons has media related to Mini Moke.